"Jamaica can get shoot through your veins and become like every dark sweet thing that not good for you." Not only is that sentence a near-perfect thematic description of this hard-to-put-down 700-page novel as a whole (the allusion to drugs is intentional, of course), but also it's exactly how I feel about the novel itself. This is a novel, and these are characters, that will stick with you for a long time. I don't know if it was "good" for me, per se, but I know I enjoyed the hell out of it. 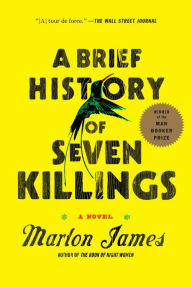 The closest comparison I can think of to this novel of Jamaican gangsters, CIA agents, double-crossing drug dealers, and one enterprising Rolling Stone journalist is that it's a Jamaican version of the HBO show The Wire. This novel, like The Wire, turns stereotypes on their heads (gangsters that read Bertrand Russell, gay hit men, etc.) in a complex plot where everyone has an agenda and loyalty is a sliding scale. I loved The Wire, but I liked this even more — the characters here are even more complex, there's even more moral shading, and it's a plot with even more scope and reach than could ever be done in a TV show. We go from the mid-1970s Kingston, to the late 1970s Kingston, Montego Bay and Miami, to the crackhouses of mid-80s and early-90s New York City. That said, the first 300 pages take place over only two days in early December, 1976 in Kingston. We meet several characters — street kids, dons, enforcers, American journalists, CIA agents, Cuban "consultants," an upper class Jamaican woman, politicians, and even a ghost! The diverse characters, who take turns narrating their own stories in their own voices, are what makes this novel great. The distinction and variety of these voices (James writes his Jamaican characters in Jamaican "dialect," but it's not difficult to read, and you get used to it quickly) really draw you in, which is quite a feat. Sometimes, novels with lots of narrators keep you at arm's length, because you're more invested in some characters than others. Not so here — each of these is interesting for his/her own reasons, and I never started reading a section thinking "Ugh, can't wait to get through this guy's story to get back another." And but so, the Kingston gangs have close ties to Jamaican politics (if you're going to read this, and I highly recommend you do, do some quick Wikipedia-ing on the Jamaica Labour Party and the People's National Party), and with an election coming up, and a concert (Smile Jamaica), the eyes of the world are on Kingston. The real fulcrum of the plot and what sets everything spinning is a real-life event — an attack on reggae legend Bob Marley at his Kingston home just days before the concert and weeks before the election. This scene and its immediate aftermath are depicted from several perspectives in about 50 I-forgot-to-breathe pages that are truly, unimaginably great. These pages are when I knew I loved this novel. From there, we go 1979 in Jamaica, then to New York and Miami as the gangs team up with the Columbian drug cartels and take over parts of New York. But the attack on Marley looms large through the rest of the novel, even after Marley's 1981 death, literally until the last page. One word of warning: This book is intensely violent — so it's not for the faint of heart in that regard. And the plot is complex, but certainly not impenetrable. You just have to keep in mind characters' motivations, loyalties, and why you think they're doing what they're doing. Just trust James that things will make sense. So it's certainly not a novel everyone will be interested in, or like...but I loved it! It just feels like something so cool and inventive and unlike anything I'd read before (which, amusingly, is in stark contrast to most people's impression of Man Booker winners). I'd been trying to talk myself into reading this since it first came out last year, and I'm super glad I did. So if you're on the fence too, just take the plunge. It's an immensely rewarding reading experience.